we daya machinery is experienced on the PET preform molding. such as PCO preform, BPF preform, miner water bottle preform, juice water bottle preform, oil bottle preform,etc. and also different weight, such as 14g 350ml, 17g 500ml,31g 1000ml, etc. 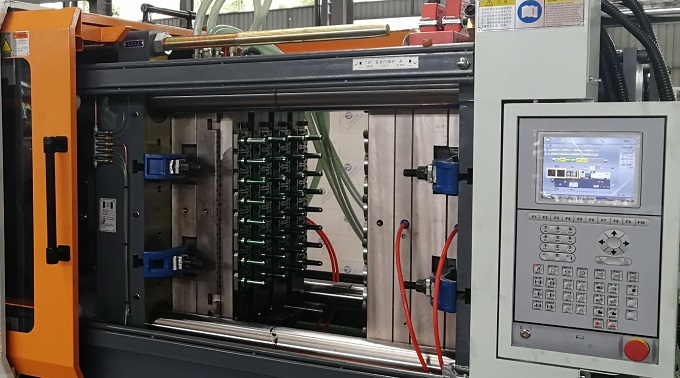 we did many turn-key projects for the production line of making PET preform in many different countries, such as Thailand, Malaysis, Russia, Mexico, Peru, Brazil,etc. Generally, the production line of making the PET preform include injection molding machine (special designed for PET ), preform mold, hopper dryer, auto loader, chiller, dehumidifier,belt conveyor and cooling tower. see below picture. If the factory doesn’t have the compressed air source, the air compressor also needed. PET plastic injection molding machine series are designed and manufactured according to PET Machine moulding technologies, the professional screw and barrel design, precise temperature controlling system, special ejector design,etc. DAYA PET machine are available for servo motor type with the hydraulic system and plasticizing system, the controlling system are also optional. PET plastic moulding machine is one of the main products range for us, we are investing much on PET machine researching and developing. 220ton PET preform injection molding machine DY220PET. by this machine, we can run 8 cavities, 16 cavities of PET preform mold. for example, 16 caivites, 28mm neck diameter, 24g weight, the cycle time is approx 22s. Generally, by this machine, we can run 24 cavities, 32 cavities PET preform mould. For example, the preform mold on below picture. 32 cavities, 16g, 28mm neck diameter, the cycle time is approx 25s. by this machine, generaly, you can run 48 cavities preform mould. such as 16g, 26g, 33g ,etc. the cycle time is approx 27s. please don’t worry if you are new to the making of PET preform. we are ready to help you at anytime. please kindly inform below information with the inquiry, so that we can send you the quotation list at first time. what’s the PET preform for? such as water bottle, drinking bottle, oil bottle,etc. what’s the neck diameter and weight of the preform? what’s the required output capacity per hour/month? what’s the working voltage in your place? please feel free to contact with us for any inquiry.